This pack has been designed by Paul Frederic Brown Magnus, a philosopher of science, associate professor at the State University of New York at Albany who has designed many games and games variants. 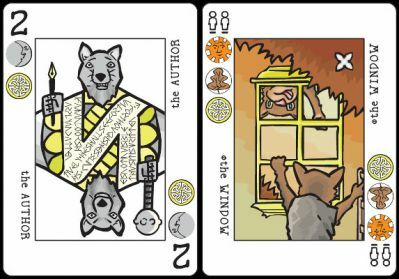 Each card can bear up to three suit signs from a set of six. The core of this pack contains 36 cards from ace to nine and king, each with either one or two suit signs. I was even more impressed by the number of rules proposed by the author and many fans. These rules take advantage of the fact that the suits are not as symmetrical as those of a regular pack. The Decktet is available as a digital document (free). Two variant packs are also proposed: Дектет, a russian version and Deco Decktet with abstract figures. Price and where to find: US$ 10 on www.thegamecrafter.com or www.drivethrucards.com. 230 pages rule book at US$ 15 on lulu.com.